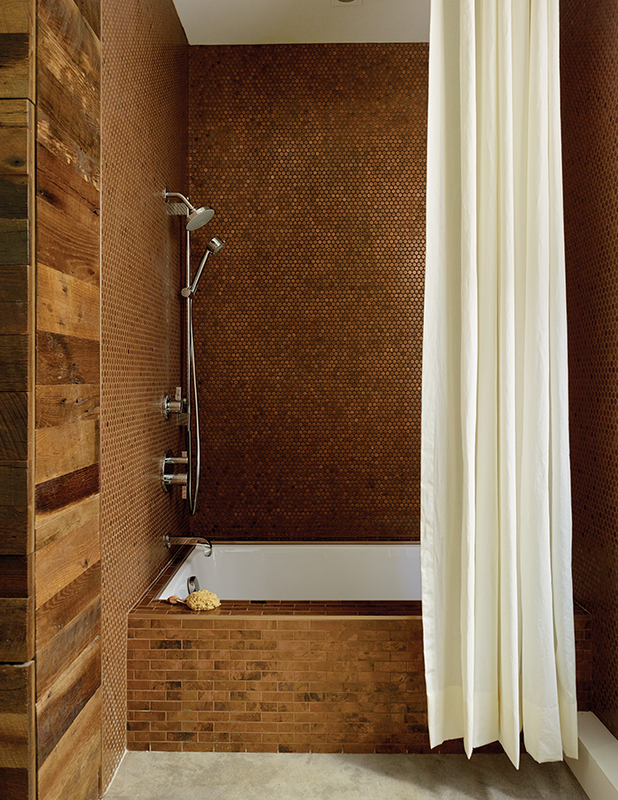 The walls are clad with metal penny tile in the Antique Copper finish from Design and Direct Source of Portland, Oregon. Linear-format tiles in the same finish line the tub. 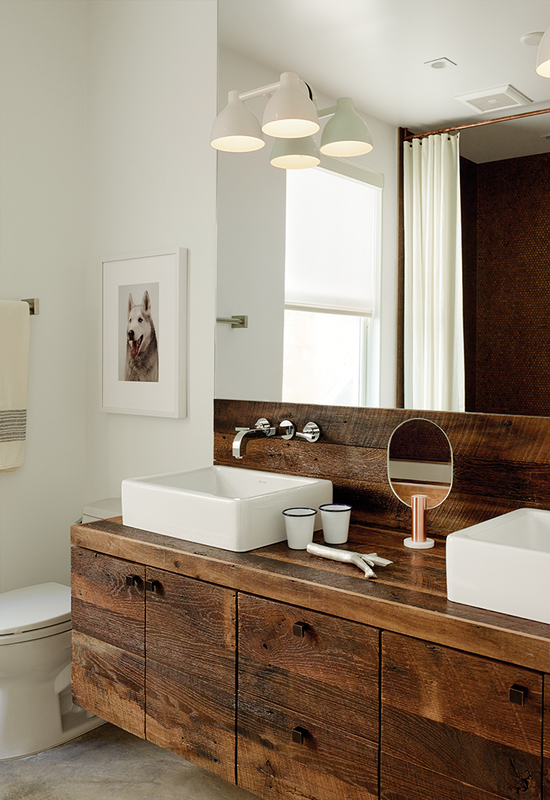 Builder Luke Gilligan of Gilligan Development used reclaimed oak planks from a deconstructed barn to create the bathroom’s millwork. To achieve the rugged look, he sanded and wire-brushed the wood, then applied a clear stain. The sinks are from Duravit’s Vero line and the cabinet pulls are from Top Knobs. When they were hired to renovate a Victorian in San Francisco’s Noe Valley, designers Lauren Geremia and Emily Ord first looked at the existing materials. Presented with a concrete floor in the bathroom, they sought ways to introduce warmth and softness to the space. “I love the aging quality of copper and how it patinas in an interesting way,” Geremia says. They discovered metal penny tile in the Antique Copper finish from Design and Direct Source of Portland, Oregon, and used it to clad the walls from floor to ceiling. Around the tub, Geremia and Ord opted for linear-format tiles in the same finish. By keeping large swaths of the surface monochromatic, they created a graphic effect that wouldn’t overwhelm the small space, Geremia says. Anticipating that the copper would dull over time, the designers opted for contrasting chrome fixtures from Hansgrohe, a brand they selected for its modern aesthetics and reliability. A custom linen shower curtain and copper rod by Rachael Brune are the finishing touches. “It’s about striking a balance between warm and cool materials and warm and cool colors,” Geremia says.